The SID11x2KQ is a single channel IGBT and MOSFET driver in an eSOP package. Reinforced galvanic isolation is provided by Power Integrations’ innovative solid insulator FluxLink technology. 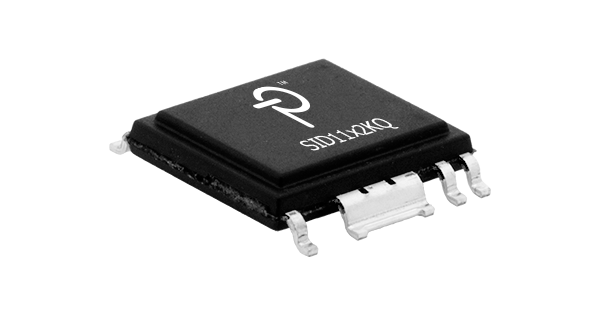 8 A peak output drive current enables the product to drive IGBTs and MOSFETs up to 600 A (typical) without any additional active components. For gate drive requirements that exceed the stand-alone capability of the SID11x2KQ’s, an external amplifier (booster) may be added. Stable positive and negative voltages for gate control are provided by one unipolar isolated voltage source. Additional features such as short-circuit protection (DESAT) with Advanced Soft Shut Down (ASSD), undervoltage lock-out (UVLO) for primary-side and secondary-side and rail-to-rail output with tempera-ture and process compensated output impedance guarantee safe operation even in harsh conditions. Controller (PWM and fault) signals are compatible with 5 V CMOS logic, which may also be adjusted to 15 V levels by using external resistor divider.